Peter Joseph Mallon was born on December 5, 1929 in Prince Rupert, British Columbia. He received the greater part of his elementary schooling in Terrace, B.C., until his family moved to Vancouver. He attended high school at Christ the King Seminary, directed by the Benedictines. After continuing his studies in philosophy and theology with the Benedictines at Mission, B.C., he was ordained to the priesthood on May 27, 1956 at Holy Rosary Cathedral, Vancouver. He ministered at the Cathedral, first as assistant and later as rector, from 1956 to 1982. In 1982, he became pastor of St. Anthony's Parish, West Vancouver, until his ordination as Bishop of Nelson, B.C. on February 2, 1990. On June 9, 1995, Most Reverend Peter Mallon was appointed sixth Archbishop of the Archdiocese of Regina and was installed on July 11, 1995. In 1998, with the restructuring of the diocese of Saskatchewan, the diocese of Gravelbourg ceased to exist, and the Archdiocese of Regina was rejoined to the greater part of the (former) diocese of Gravelbourg. 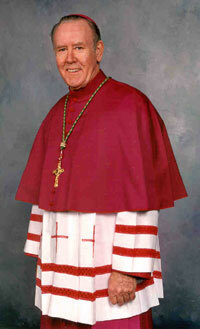 Archbishop Mallon celebrated his 75th birthday on December 5, 2004. He retired in 2005 after 9 and a half years as Archbishop of Regina. He celebrated his 50th anniversary as a priest on May 27, 2006. Bishop Peter succumbed to cancer on February 3, 2007. A celebration of his life was celebrated at Holy Rosary Cathedral on February 8, 2007.